Ringu Tulku Rinpoche welcomed the 17th Karmapa once more to Bodhicharya Berlin and confessed, “We didn’t make any progress with the building, but,” he continued, “we are determined to work for the people here and for the Dharma.” He highlighted in particular the programme of hospice training and the volunteers who cared for the dying–currently they are looking after thirty people–and presented His Holiness with a list of names of the dying and those who had died, requesting prayers for them. As at previous centres during this visit, the Karmapa took the role of chant master and led everyone in the opening prayers. There was a simple mandala offering. After greeting everyone and expressing his delight at returning to Bodhicharya Berlin once more, His Holiness commiserated with everyone over the lack of progress in constructing the centre. “It just shows that it is not an easy undertaking to establish a large Dharma centre in a huge city like Berlin,” he said, then thanked Ringu Tulku Rinpoche and the members and said how much he appreciated their efforts and the work they were doing. 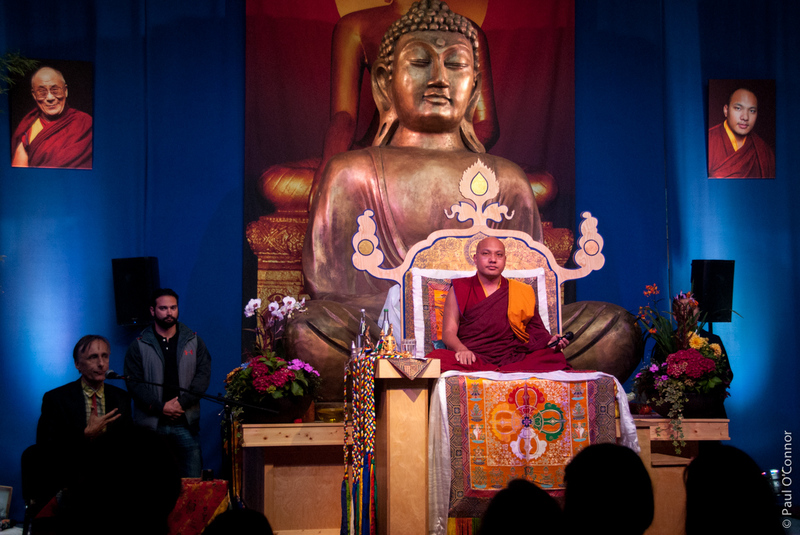 As this would be his last teaching during his 2015 visit to Europe, the 17th Karmapa chose to return to the theme of how we must integrate the practice of the Dharma into everyday life. “I would like to talk again about what is really indispensable on the path, and what the heart essence of Dharma practice is,” he explained. His first point was that we should strive to make our lives meaningful, based on an appreciation of their preciousness. “All Dharma practice should support this goal,” he said. His second point was that, unfortunately, we often restrict our practice to a particular time when we say prayers or meditate, and then the rest of the time we are busy with our day-to-day life. If we compare the time spent practising with the time spent on other activities, it is obvious that this is not what might be called a successful Dharma practice. If our Dharma practice is to be successful, the Dharma has to permeate our lives, and not be restricted to a certain time of day spent in our shrine room. “We have to connect ourselves with the essence of the Dharma in all the other parts of our lives, right there where we live and work,” His Holiness emphasised. Some people mistakenly believe that the purpose of Dharma practice is to have a direct encounter with a yidam or meditation deity, or to gain some power or energy through this. However, such experiences are not the way to turn our lives into something meaningful and precious. At all times we should guard against arrogance. It seems that some people believe practising Dharma sets them apart and makes them special in some way, superior to all those who don’t practice Dharma, the Karmapa warned, and to illustrate the point, he recounted the fable of Gold and Mud. With these words, his Dharma talk ended, and after thanking everyone again and reiterating his hope that next time he would be able to visit other countries in Europe and meet Dharma friends there, he presented the centre with a signed thangka of Shakyamuni Buddha. Following the teaching, many of the members from across Europe were able to have a private audience with His Holiness. They queued good-naturedly on the path outside the main house until their turn came to climb the narrow wooden staircase to the fourth floor, squeezing past those on their way down. Then, all too soon, mid-afternoon, the 17th Karmapa left the centre to return to his hotel. He smiled and waved goodbye to the hundreds of people milling around the path and gate and along the road outside the centre, who had waited patiently for a final glimpse of him. The official programme of his second visit to Europe had reached a successful conclusion. Bodhicharya Berlin is located in the former East Berlin. Originally an old farm which had fallen into disrepair, it is a protected site because of its historical importance. Much love and support has gone into the refurbishment of the buildings, stage by stage. The vision is to create not just a centre for Buddhists, but a welcoming space for inter-faith dialogue and activities which enhance physical, mental and spiritual well-being such as yoga and Tai chi. already, an important part of the work of the centre is hospice training and looking after people who are dying. It is a non-sectarian Buddhist centre, inviting teachers from all four main traditions of Tibetan Buddhism and also from non-Tibetan Buddhist traditions. You can find out more about the Bodhicharya Berlin Shrine Room Project here. You can watch this teaching, and all the others from the 2015 Europe Visit, here.